No, not Michael Phelps. The one with the mustache. It goes without saying that with this single photo, Spitz still holds the Olympic record for Most Patriotic. Your move, Phelps. Source. 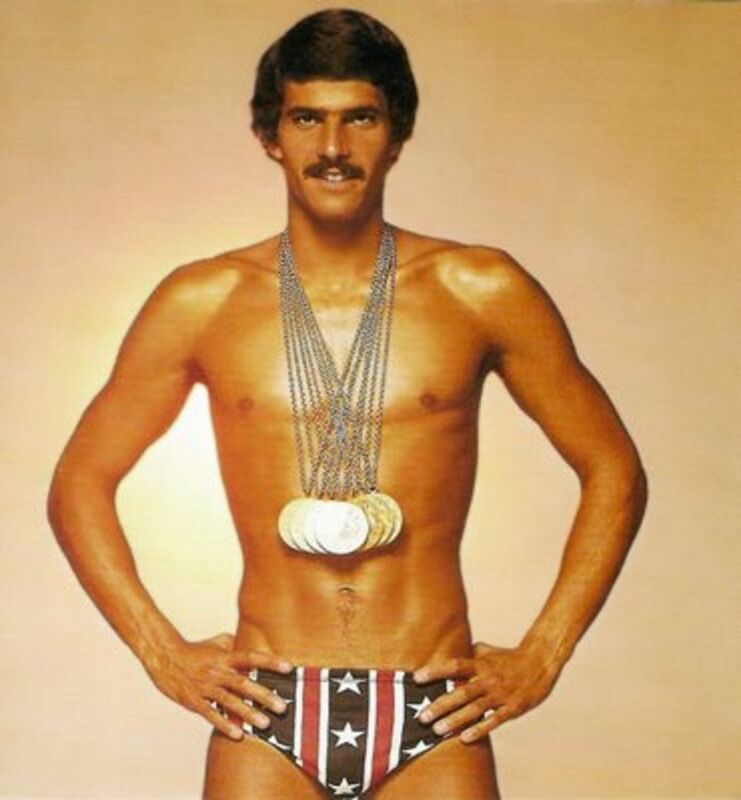 Mark Spitz retired from swimming at the ripe old age of 22, but prior to that point he sliced through records like butter—or, shall we say, water—until he earned all nine of the gold medals that you see ever-so-proudly displayed here. At the 1972 Munich games (his second and final Olympic appearance), he won more medals than any person had won in a single Games up to that point. And then, he called it a day. Last year, a reporter with NBC Sports caught up with Spitz and asked him why he didn’t stick around for the 1976 games in Montreal. Spitz responded, “The $64,000 question is what I would have swum there.” Recognizing that he would probably not get to compete in as many events, he took “quit while you’re ahead” to the extreme, doing what he calls an “exit stage left” from his career and settling down with actress Suzy Weiner. And now, after decades, Michael Phelps is reminding Spitz—and everyone watching at home—that world records were made to be broken. The funny thing is, it doesn’t seem to bother Spitz. “I did something before he was born that became a benchmark that he could judge himself by,” Spitz told NBC. “How could that be bad for me?” How’s that for sportsmanship? A stand-up guy (unless he’s in a pool), that Spitz. Adjusting for inflation, then, the $369,000 question is…what’s next for Phelps? Is he, as Ryan Lochte claims, “guaranteed” to head to the Tokyo Olympics in 2020? Or will he spend his 35th year sitting on his gold medals and cheering on the next generation? Either way, I and all of the other former Nadia Comaneci wannabes can’t wait to get caught up in it all over again in another four years.